The ultimate controversy: hardwood being installed in the kitchen. Should it be allowed? Is it worth it? Will I lose out on a massive investment? All of these thoughts may be racing through your mind as you contemplate adding hardwood floors into your kitchen. To help homeowners make this decision, we dug a little deeper into the topic. Let us take a look! Can Hardwood Floors Be Installed in The Kitchen? As you may already know, areas like the kitchen and bathroom are more prone to moisture. With moisture being a factor, homeowners often worry about potential water damage on their brand new wood floors. Realistically, when homeowners are using the kitchen, they seldom drip water unless they are transporting a pot of hot water from the stove to the sink or if the kitchen faucet is leaking or sprays abruptly. If an incident like this does occur, a quick response can help reduce the overall effect it will have on your hardwood floors, in essence, not affecting your floors at all. Now, let us imagine a more horrifying circumstance was to occur in our kitchen, say like a flood or your dishwasher overflows. What would be your options if you want to look at prevention for those circumstances? We are glad you asked! During the installation, installers will apply a stain or sealant to provide an extra level of protection on-site to your unfinished floors. Some experts prefer sealing at home because it tends to fill in seams with additional sealant, which in essence provides homeowners with more protection. Some experts recommend purchasing hardwood that is pre-finished to ensure a stronger, tougher sealant. In the factories, the sealant is “baked on” by strong lights to provide a proper sealant. But ultimately, the decision to purchase pre-finished or unfinished hardwood is up to the consumer. Engineered hardwood is an ideal option for homeowners looking for a highly water-resistant flooring material. Engineered hardwood is composed of many layers, the top layer is 100% natural wood. The layers underneath consist of plywood, which runs in different directions in order to prevent unwanted contraction and expansion. Typically, we see contractions and expansions found in hardwood floors that have been exposed to moisture, humidity, or extreme temperatures. With engineered hardwood, you can have the authentic look and feel of hardwood without the fear of water damage. 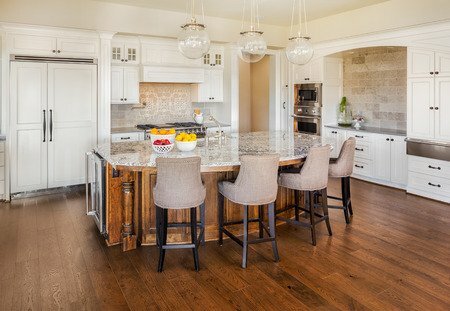 There are a few points that homeowners will need to consider before they decide whether or not hardwood floors are right for their home’s kitchen. For starters, you will want to take into consideration the amount of traffic that your room sees. In high-traffic kitchens, you will need to be aware that potential scratches or wearing of the surface are possible. Luckily, the solution is quite easy with sanding. You can sand the surface for a brand new look. If you are concerned about potential scratches or dent marks, you can “soften the blow” with a stylish throw rug or runner. Plus, let’s be honest, rugs add a sense of style and flair to the room by tying together your whole design. Sunshine is a great thing; unfortunately, hardwood floors would have to disagree. The sun can have a “bleaching effect” on areas that are in direct sunlight. To help better protect your floors, we recommend drawing the curtains during the daylight hours to reduce the effects caused by the sun. While the whole topic and decision process may feel overwhelming, let us help make it easier on you. Take a look at our hardwood selection online at https://bit.ly/2Osa4zy and call us or visit us for more information and guidance. We have a friendly, knowledgeable staff that is ready to answer all of your questions. We look forward to the opportunity to work with you.